Finally, after all the 90 degree days, there is a chill in the air! I love autumn. I do not like the shorter days and longer nights thing, but I do love the weather. Walking with my dog in the cooler air is far more appealing. It has become quite clear to me why, over all the years of our marriage, my husband still tends to stay up late and I tend to get up early. It can be summed up in one word: dogs. Except for a few short months, we just have always had a dog. Now having a puppy while my husband has been away through the week is more challenging because I am the only one who is making sure our little Mishka is getting out when he needs to do so. However, being that he just 11 weeks old, I am quite impressed that he sleeps about 5 to 6 hours straight at night now. I used to only sleep about that many hours a night for most of my life, but these days another hour does a bit better for me, however it is more doable than every two to three hours taking out a puppy. I have gotten to know Mishka a bit better in the past three weeks. His favorite game is to grab a shoe, sandal, or sock and play keep away...and he would probably chew on them if we were not watching him. He likes to grab the shoes by the door a lot so we had been working on that bad behavior. 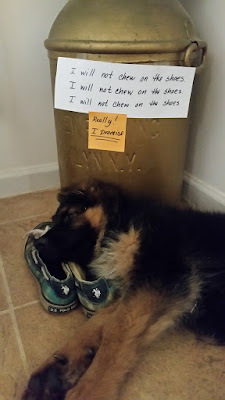 He was sleeping on those very shoes when I got the idea for this picture. No, I was not shaming him, he just was opening his very sleepy eyes without moving. Mishka's own toys are just not quite as fun in his eyes, but he loves balls and a particular squeaking snake toy I got him in the last week, with three separate large squeakers. When we squeak that one, he will drop what he is doing and try to pounce on it, but squeaking it too much makes him frustrated, which my teenager is learning the hard (teeth biting her) way. Mishka still fights to stay up and can get rather nippy during that time. Determined to nip means time for a nap and if he will not lie down on one of the floor vents, which are his favorite places, then he gets placed in his pen. Since he is already 20 pounds, lifting him when squirmy is getting to be a challenge and he has not mastered going down the front steps, which are not carpeted like the ones inside...a few more weeks for that. When I say nippy, I mean he really goes after us, especially the feet and ankles but also hands, arms, and clothing. German Shepherds have a herding instinct so we have to work with him so that he is not "herding" us, which is why he nips at the feet and lower legs. He has already ripped two of my lightweight jeans and I dare not wear a skirt! We have to be very wary walking in our house about what mood the Mishka is in. There is that Fenris side that comes out now and then. However, for a puppy his age, he is actually on the calm side, I think. I mean, puppies are puppies with immediate needs and chewing is their life, but he is not hyper, which makes me thankful now that we decided on another German Shepherd rather than a Belgium Tervuran. A nickname has not officially emerged yet. In our house, the nicknames are longer than the name. For now I find myself often saying, "Mishka, my mishka." It just seems to fit. My Lord, thank you for this new member to our family. May he grow and learn to be a good companion and protective guard dog and...well, just everything we need him to be for our family.